Here it is, our masterpiece. I say ours, but it's my friend Amber's home. I will let her tell you the rest. "My father-in-law is a mason and created this wall and fireplace 40 years ago. We were very hesitant to change something so drastic that he worked on , and did a fantastic job. As you can see, it is not a small area, it is one whole wall in the downstairs family room." "We are very pleased with the results and the overall change we have made to our home. 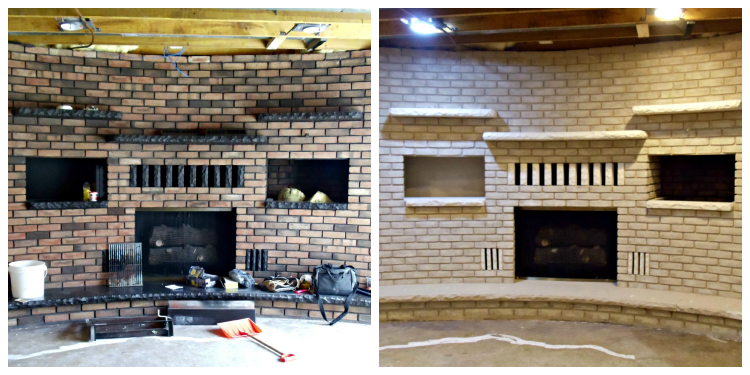 We get so many compliments on the way the brick still looks like brick and not the “flat” painted look! Tanya, thank you so much for helping me with this." So, what do you think? Did we do a good job? Yes, it did take us a long time. Amber chose Twilight Taupe color themed paint from the brick paint kit selection. The paint is guaranteed to make sure your brick retains it's natural masonry look unlike just slapping paint on it.